Be the first to share your favorite memory, photo or story of Lyle . This memorial page is dedicated for family, friends and future generations to celebrate the life of their loved one. Lyle A. Boyle, age 77 of North Branch, passed away April 10, 2019, in the comforts of his home. Lyle was born and raised in North Branch, MI. He loyally served his country in the United States Army as a Military Policeman during the Vietnam War. Lyle received his bachelor's degree in education from Central Michigan University. He taught special education at the Lapeer County Woodside School for 25+ years. 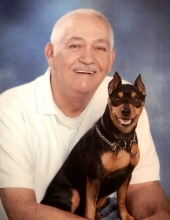 Lyle was very close with his family and dearly loved by all of them, including his faithful dog Jack. Lyle is survived by his sister Caroline Woodward, his brothers Lowell (Sally) Boyle, Earl (Roxanne) Boyle, Cecil (Corinne) Boyle, Kelly (Michelle) Boyle; his sister Kendra (Russell) Richmond. Also many nieces, nephews, and extended family members. Lyle was preceded in death by his parents Charles J. Boyle & Florence M. Boyle; his brother Jerome Boyle; his sisters Harlene Chambers, Ellen Ann Walker, Mina Haggadone, and Helen Meservey. A memorial service will be held on Tuesday, April 16th at 1:00 p.m. at Lynch & Sons Funeral Directors - Capstick Chapel. Pastor Ron Hutchinson will officiate. Friends may visit with the Boyle family from 12:00 noon until the time of service. Memorials to McLaren Visiting Nurse & Hospice are appreciated. Lyle's cremated remains will be placed into a niche with military honors being performed at Great Lakes National Cemetery on April 22, 2019, at 1:00 p.m.
"Email Address" would like to share the life celebration of Lyle A. Boyle. Click on the "link" to go to share a favorite memory or leave a condolence message for the family.